This video from Space.com, shows the first picture of a total solar eclipse. I chose the clip because it shows the first picture of an eclipse and how it was captured. 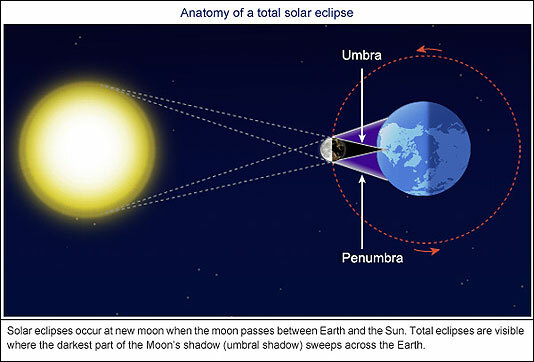 This shows how the solar eclipse works. When the Moon lines up directly with the Sun it creates a shadow that casts a spot along the Earth. I chose this graph because i think it is a good representation of the solar eclipse. The path of totality is shown on this chart. It runs through Oregon, all the way through South Carolina. I chose this picture because it is an accurate representation of the path of totality.